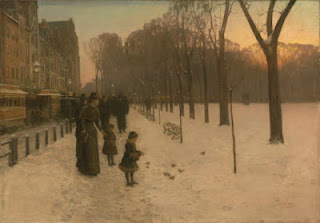 Inspiring Art Teachers to Explore Art History | Curator’s Corner: Happy Holidays! I’m not big into the whole commercial Christmas thing, but I am into Christmas trees. In the spirit of that, I offer you one of my favorite paintings of trees. Granted, it’s not loaded with ornaments and lights, but, geez, it’s a gorgeous little study of a blossoming tree. What better way to celebrate the “holidays” than celebrating nature? After all, the evergreen (Christmas tree) is an ancient symbol of the endurance of nature and rebirth in all cultures. What better symbol for this season than the tree? And, speaking of “rebirth,” one could say that American impressionists fueled a rebirth in American art at the end of the 1800s! Through the colonial period up until the 1800s, American artists looked to European painting for inspiration. Although the American Academy of Fine Arts (Philadelphia) and the National Academy of Design (New York) were well established by the mid-1800s, young American artists during the 1880s looked to France for inspiration in painting. Despite the infusion of Impressionism and other modernist tendencies early in the 1900s, Realism persisted as the chief American mode of expression into the middle of the 1900s. But, thank goodness for American Impressionism! 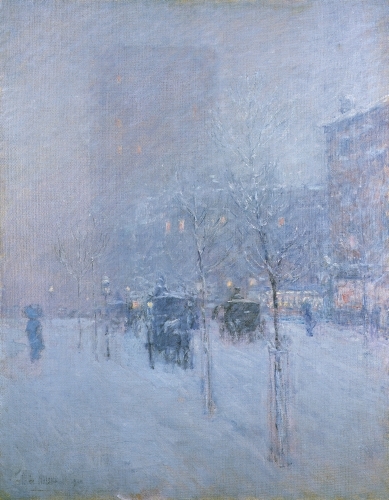 Childe Hassam was born in the Boston area and trained as an illustrator and painter. By the 1880s he was painting scenes of Boston in the dark palette of the Munich school, a group aware of Impressionism, but emphasizing contrasts in light and dark much like Baroque artists. That style is now called Dark Impressionism. Hassam went to Europe in 1883, spending three years in Paris starting in 1886, during which time he was exposed to Impressionism. His palette lightened and he adopted the short, quick brush strokes of Impressionism as well. 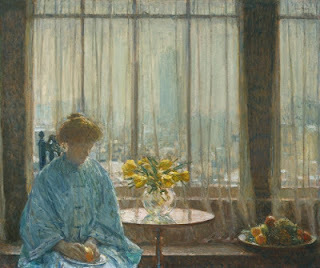 Back in New York, starting in 1890 Hassam painted in the impressionist manner. Initially, he and the other Paris-influenced artists were not critically acclaimed. But, by the mid-1890s, Impressionism was a more-or-less accepted style in American art. Hassam’s favorite locations to paint in the summer were in New England. This painting of a brook near New Canaan comes from his summering in Cos Cob. 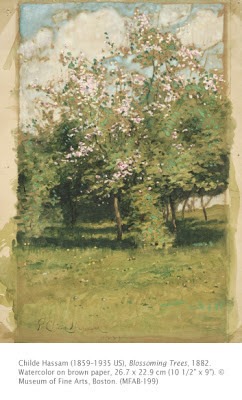 He also produced many paintings from the artists’ colony in Old Lyme, CT. This work, while still displaying the broken color and importance of brush work of all Impressionism, also shows how, throughout his life, Hassam leaned toward more expressionistic brush work. I love this work, because not only is it a study, but, in my mind it mimics a Christmas tree—the blossoms are the lights! Studio activity: Create a personal tree. In a personal style, create an artwork with a tree as the subject. Use chalk, oil pastel, or acrylic to engender expression in the tree depicted. Try to personify the tree, give it emotion that expresses a personal point of view. Choose colors, exaggerated lines and shapes to make the tree seem calm, energetic, angry, happy, or sleepy.